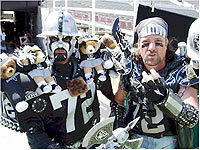 2010 NFL Predictions - Oakland Raiders NFL Schedule & Super Bowl Odds: With 60-1 NFL odds to win the AFC championship and 125-1 2010 NFL odds to win Super Bowl XLV, the Oakland Raiders start the 2010 NFL predictions season with the longest NFL odds to win Super Bowl XLV as any team in their conference. The Raiders, though, are trying to turn the page on their 11-loss NFL picks season in 2009, turning to a new quarterback and a relatively young and untested roster. Gone is quarterback JaMarcus Russell, a first round draft choice that became a total bust. Russell’s inept play became a symbol for the franchise’s woes in recent years and his departure, along with five other players who played prominent roles in recent years, means a fresh start on the 2010 NFL schedule for the franchise. The man given the keys to the car is ex-Redskin Jason Campbell, who had a productive if not distinguished career with the Redskins. He was careful with the football, rarely making the big mistake to lose games but also rarely making the big play to win their NFL predictions matchups. Campbell will have a healthy Darren McFadden back at running back as well as wide receivers Louis Murphy, Chaz Shilens, and last year’s #1 pick Darrius Heyward-Bay. Zach Miller also returns and could play a huge role at the tight end spot, and a favorite target for Campbell. On defense, the secondary ranked seventh in the NFL in pass defense, with All-Pro corner Nnamdi Asomugha leading the way. Problem was a year ago everybody ran on the Raiders so the impact was minimal to the team’s overall success. The Raiders surprisingly re-signed ex-Pat defensive lineman Richard Seymour. His presence and renewed commitment should help the Raiders in the 2010 NFL predictions season. The team also signed run-stopping linebacker Kamerion Wimbley in the off-season, which could help the run defense. Overall, the Raiders have much to prove and, perhaps, Campbell will give them a spark. However, it will take much more than a spark to get this team to the 2010 NFL playoffs or, for that matter, a .500 record. If your crazy enough you can bet on the Raiders to make the 2011 Super Bowl picks matchup at Bodog.com and take advantage of their NEW bonuses! The Vegas style online sportsbook is now taking NFL predictions on everything NFL, including your selection on who will win the 2011 Super Bowl. Whether you plan to Bet the Raiders or anyone else Bodog.com has got your game.